Polyvinyl chloride, more commonly known as PVC, is the third-most-widely produced synthetic polymer, after polyethylene and polypropylene. PVC is part of the vinyls chain, which also includes EDC and VCM. PVC resin grades can be used for rigid and flexible applications. The rigid grades of PVC are used in construction for pipe and in profile applications such as doors and window frames. It is also used for bottles, other nonfood packaging, and credit cards. PVC resin can be used in flexible applications by the addition of plasticizers. In this form, it is also used in wire and cable insulation, imitation leather, signage, inflatable products, roofing membranes, and many applications where it replaces rubber. PVC resin can combine with many additives, yielding PVC compounds that are then converted into a wide variety of forms, such as pipes, fittings, profiles, tubes, windows, doors, sidings, wire, cable, film, sheet, and flooring. This ability, together with features such as durability, nonflammability, resistance to chemicals and oil, mechanical stability, and ease of processing and molding, means that PVC is a competitive and attractive option for many end uses in construction and infrastructure, agriculture, electrical products, and healthcare. Thus, although its end-use portfolio has moved toward construction applications and away from many consumer items, PVC’s long-term future is secure. Northeast Asia accounted for over 50% of the global supply of PVC, with China being the main producing country in the region. China is currently the largest player in the global vinyls market, holding the largest capacity, output, and demand. PVC demand emerged in China in the 1990s then accelerated rapidly, and China quickly became the world’s largest PVC importer. The growth in demand soon resulted in massive investment in vinyls capacity in China, enabling the country to move toward self-sufficiency. Capacity continued on an upward trend and grew extremely rapidly, leading to a huge capacity excess today. The scale of the Chinese industry is such that the country’s overcapacity depressed the operating rate of the world as a whole and much rationalization has been necessary in recent years. The construction industry plays a key role in the PVC market. Therefore, demand for PVC is closely aligned to economic development. In recent years, the stronger PVC consumption has been concentrated in the developing economies in Asia, such as China, India, Vietnam, and Indonesia. For high-demand locations, the common drivers of consumption are a large population base with a stable political climate that still needs considerable spending on infrastructure. Northeast Asia is expected to remain the largest regional market. China will remain the largest consumer and producer of PVC in the world for the foreseeable future. North America is the second-largest PVC producing region in the world behind Northeast Asia, and this position is not expected to shift over the next several years. In North America, the main driver for demand is the construction industry in the United States. The United States accounted for 81% of the region's consumption in 2016. The United States is the largest PVC exporter in the world, accounting for about 32% of global exports. The offshore PVC markets will remain an important outlet for US producers, especially given the modest growth in the domestic market. More importantly, its low-cost position allows US producers the option of shipping its PVC to most parts of the world competitively. During 2015 and in early 2016, resin cash costs for chlor-alkali integrated producers in North America had a steep downward correction as the global energy values were affected by the crude oil price deflation. Despite this correction, which reduced the advantage with other PVC-producing regions based on naphtha economics, North American producers should continue to enjoy an advantage, albeit smaller, versus European and Asian PVC producers in the forecast period. Demand in North America is expected to see about a 2% growth per year through 2021. Western Europe is the third-largest PVC producing region in the world, accounting for almost 12% of the global supply in 2016. Western Europe follows a somewhat similar trend to the United States since both markets are a similar size, both are mature markets with subdued growth prospects relative to many other markets around the world, and both are surplus regions. Since the prerecession peak of 2007, PVC capacity in Western Europe has declined by about 15%. However, the net drop in domestic demand between 2007 and 2016 was more dramatic, at 31%. Although domestic demand is forecast to continue to grow, it will be many years, if ever, before it returns to prerecession levels. Although demand in Western Europe has declined over the past five years, it is expected that demand will improve slightly over the forecast period, growing at about 1% per year over the next five years. Consumption of PVC resins is expected to continue to grow at a healthy rate of about 3% per year over the next five years. 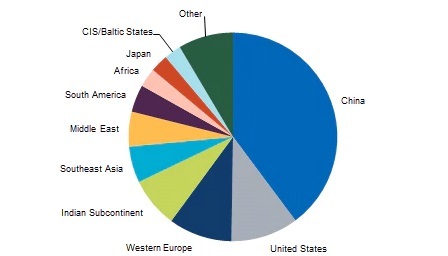 Three regions drive PVC demand―Northeast Asia (mostly China), North America (primarily the United States), and Western Europe. Together, these regions account for about 63% of world PVC demand. Last: Why ABS and V0 flame retardants are easy to carbonization?